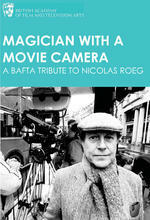 Danny Boyle and many others pay tribute to the cinematic visionary Nicolas Roeg, "the magician with a movie camera". At this special BAFTA event in 2009, Roeg took to the stage to accept the BAFTA Special Award - presented for Outstanding Creative Contribution to Cinema. Roeg died on 23 November 2018, aged 90. A host of extraordinary filmmakers then paid tribute to the man many cite as their career inspiration and cinematic hero. With clips from Roeg's major works they illustrated exactly why his films are held in such high esteem. Nicolas Roeg has created some classics of modern cinema as well as inspiring several generations of world-class filmmakers by virtue of his poetic eye and iconoclastic approach to storytelling. Danny Boyle considers Roeg to be as important as David Lean in the history of British cinema, and it’s impossible to keep track of the number of contemporary filmmakers who point to Don’t Look Now as among their key influences. With Performance, Bad Timing, The Man Who Fell To Earth and Walkabout, Roeg cemented his place in the modernist canon - but his influence owes as much to his uncompromising approach as to the detail of his personal creative vision.